Enda Kenny talks to reporters in Brussels. TAOISEACH ENDA KENNY met with the president-elect of the European Commission Jean Claude Juncker today, telling him Ireland would be interested in an EU role in the area of “jobs, investment and growth”. Kenny spoke to reporters as he and other EU leaders arrived in Brussels for a summit to fill two of the top jobs in the Union. There has been some speculation recently that Phil Hogan, Ireland’s commissioner-designate, may miss out on the much sought-after agriculture portfolio. That decision will be solely Juncker’s to make. But Kenny said Ireland had always had very good relations with the former Luxembourg prime minister. “Obviously he is going to make the appointments,” the Taoiseach said. I did say to him that Ireland would be interested in a commissioner-ship that would be related to jobs, investment and growth — which are our priority and our hallmark for the duration of this Government. “Obviously I expect that the Commission President-elect will take this into account. Hogan is due to hold his first formal meetings with Juncker next week. Email “Taoiseach: We want a 'jobs and growth' role for Hogan... but it's Juncker's choice”. 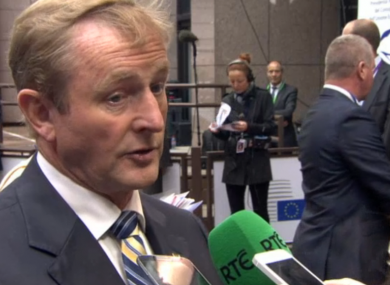 Feedback on “Taoiseach: We want a 'jobs and growth' role for Hogan... but it's Juncker's choice”.